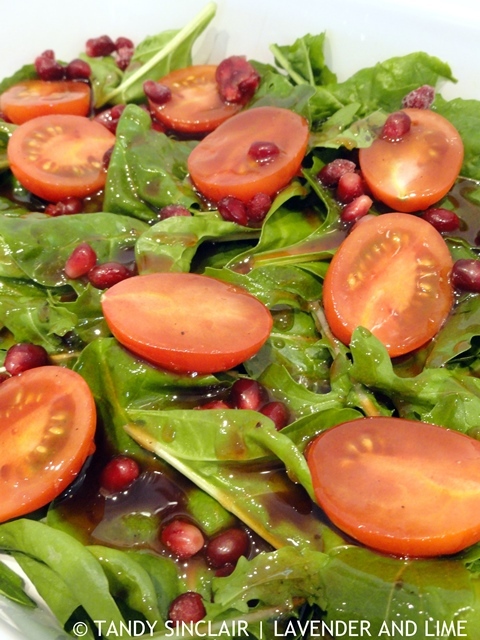 Using pomegranate concentrate which is made from pomegranate juice, I created a recipe for pomegranate dressing. The thick, sticky molasses paired with a fruit vinegar resulted in one of the nicest dressings I have made for quite some time. Once a week in summer, and as often as we can in winter, we braai. We go to a friends’ house and he lights a fire using two types of wood. One being the wingerd stokkies. For those of you who don’t speak Afrikaans I am referring to a barbecue using wood from a vineyard. The fire is created in a very specific manner and takes 70 minutes to reach the correct temperature for the chicken we are going to have for dinner. That never changes. It might be flavoured differently and sometimes it is cut into pieces but it will always be chicken. This is timed to perfection and then served with a variety of salads. If these are made at his house we are guaranteed to get a standard green salad with iceberg lettuce, large tomatoes cut into wedges, cucumber slices, feta, olives and raw onions. As Dave and I don’t eat raw onions I always bring a salad with me. Nico prefers baby tomatoes and so for our winter evening braai a few weeks ago I made a very simple salad. I used rocket and spinach from my garden and added bella tomatoes and pomegranate arils. I dressed the salad with a pomegranate dressing made with my own pomegranate concentrate. This salad was the first one to be eaten and Nico commented on how excellent it was, stating he was bored with the same old salad served up every night in his house. To me, the pepperiness of the rocket was perfectly complimented by the tartness of the pomegranate dressing. Dave agreed with me and I can see variations of this being created quite often in our house. 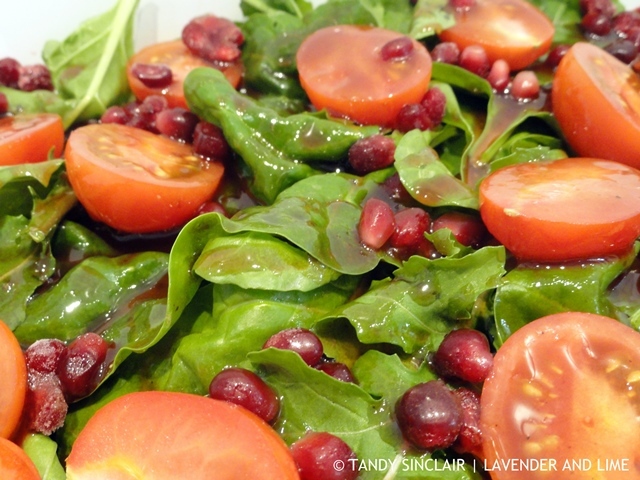 Tandy, your Pomegranate dressing with pomegranate concentrate and blueberry vinegar sounds wonderful! Wonderful salad Tandy, love the dressing, winner, winner! I’ve been wondering for some time now if pomegranate would make a good dressing, but didn’t test the waters myself. Love this idea! And the blueberry vinegar, I’ll have to keep my eyes peeled for that one =) Have a great week! Thanks, I made the vinegar which is really easy to do ? MMMMMMM, you have my drooling Tandy! I have only ever tried pomegranate molasses (out of a bottle!) so I can imagine this real homemade dressing is so sweet! Yes, rocket and pomegranate dressing would go so well together. Haven’t done that before! Just wish my pomegranate tree would hurry up and grow. This is one of my favourite dressings to make, and it goes really well on a salmon and feta salad.